The sisters gather in the foyer of the monastery, outside of the chapel, to await the arrival of affiliate Krista Ferrell at the front door. When Krista knocks at the door, Sister Nicole Kunze, prioress welcomes her and asks, "Krista, what do you seek?" This time-honored, holy tradition has carried on through the ages. Krista explained in her own words that she requests to seek God with the Benedictine Sisters of Annunciation Monastery. Sister Nicole and the monastic community surround Krista with their prayerful support and encouragement as she is welcomed into the community. 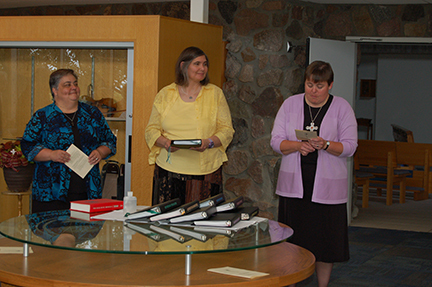 Sister Nicole presented her with the medal of St. Benedict and the books which are used to pray the Liturgy of the Hours, saying, "As you wear this medal and pray using these books, may you seek God with growing love, hope and joy, in prayer and lectio, in service, and in life shared in community." After the ceremony, Krista was lead to her room at Annunciation Monastery followed by a celebratory meal and evening prayer. God bless you, Krista! Know of our prayers! Sister JoAnn Krebsbach served as Krista's director while she was an affiliate. Beginning today, Sister Nancy Miller will serve as Krista's postulant director. Please keep Krista, and our monastic community in your prayers!